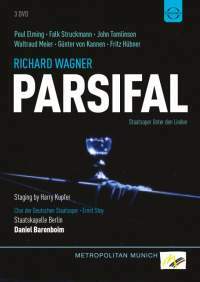 Barenboim's Berlin Parsifal has accrued some high expectations in the 20 years it has taken to reach DVD. By many people's reckoning, Barenboim is the finest interpreter of this score in recent times, and his collaboration with director Hary Kupfer for the Berlin Staatsoper regularly tops the favourites lists of critics who know their Wagner. The historical context is important. The wall had fallen just a few years before, and Barenboim had only just been appointed as the company's Music Director. A new dawn then for opera in Berlin, and a Parsifal to herald the new era. Everybody involved in the production – the company, the conductor, the director and the cast – already had significant experience with this opera, and it shows. Kupfer negotiates the work's dramatic paradoxes with impressive skill. The setting is a kind of chrome spaceship environment, somewhere between Tron and Stargate. It looks dated, or at least of its time, but that doesn't matter a bit. What's more significant is the way the staging focusses the attention, on the Grail in the acts 1 and 3 finale rituals, and rest of the time on the singers. This is one of the few productions I have seen that maintains a visual continuity between the first act and the second. The iconography of Montsalvat is inverted or parodied by that of Klingsor's castle. And the Flowermaidens scene is about the most bizarre and disturbing you'll ever see. More importantly though, Kupfer really gets his singers to act. The stasis implied in most of the scenes is overcome by the real sense of emotive interaction between the characters. Dramatically, Kundry and Amfortas are the strongest characters here. Amfortas' suffering makes the finales of the outer acts almost unbearable to watch, while Kundry dominates Act 2, bringing every imaginable emotion to bear. The cast is about the strongest you could imagine, both in terms of singing and acting. Even 20 years later, all are still working, and still dominating the Wagner world. But in 1992, they were at the peak of their powers, and able to put in some extraordinary vocal performances. Poul Elming is dramatically convincing as Parsifal. He also has the baritonal richness to his voice to compete with all the bass and baritone singers he is up against. Falk Struckmann projects the pain and suffering of Amfortas as much through his impressive vocal performance as through his acting. John Tomlinson is the Gurnemanz of our times. Perhaps he seems a little more authoritative today for his greater maturity, but in 1992 he also had a greater agility to his voice, which really helps this musically supple production. Waltraud Meier is just fabulous as Kundry. It is hard to imagine a better performance, although her voice does start to show the strain towards the end of the second act and her tone begins to thin a little. Günter von Kannen and Fritz Hübner take the roles of Klingsor and Titurel. Both pale slightly in the context of this stellar cast, but both give more than serviceable performances. I've asked around many Wagner experts, and I can't find anybody to say a word against Barenboim's reading of Parsifal. And I'll agree that he is certainly able to drive the music, and to structure its long acts. He's also got an ear for orchestral detail, but makes sure that orchestra always serves the singers. But for all that, I find his reading slightly rigid. He never slows in crescendos leading to climaxes, which then lose some impact, and a lot of the filigree woodwind writing simply sounds rushed. I'm clearly in the minority, but I'd much rather hear Haitink or Kubelik any day. The video production and sound quality are also of their time. So far as I can tell, the filming was done for Bavarian television. The style of editing is unusually static. So, for example, in the preludes to each of the acts, we watch Barenboim conducting from an unflatteringly low camera angle, with few cutaways to the orchestra. This static approach to editing serves the stage action better, especially as Harry Kupfer has obviously thought hard about the relationship between stasis and movement, a balance which is little affected by the camera work. Given the date, it is unsurprising that we are in a 4:3 aspect ratio, but that's a shame, as it often relegates the singers to the bottom third of the screen. The sound quality is OK in the pit, but the singers sound very distant. Fortunately they all have voices that really project, so it's not too much of a problem. A valuable document, then, of a historic Parsifal. Although I've reservations about Barenboim's reading, this is clearly one of the finest productions ever to make it onto DVD. Given the long and glittering careers of everybody involved here, you will probably be able to find them all involved in other Parsifal productions, at least in audio and in many cases on video too. But everything really comes together this time, so we should be thankful that the cameras were there to capture it for posterity.